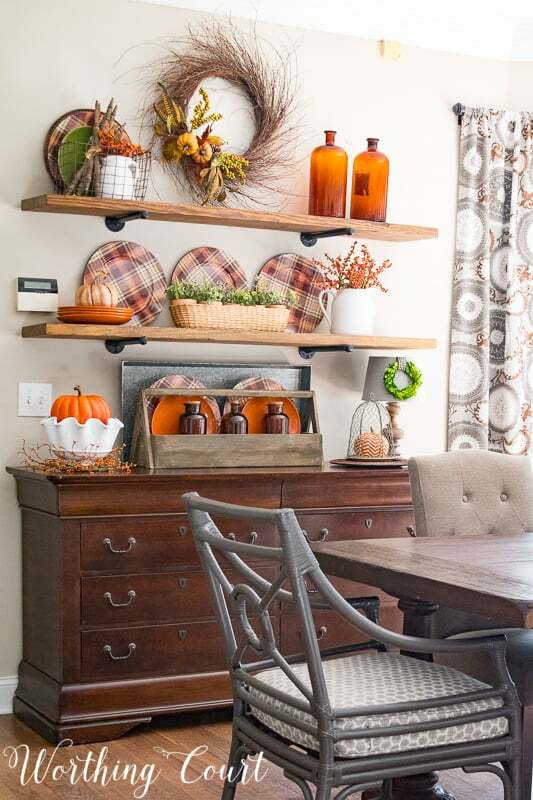 Decorating for fall doesn’t have to be complicated! 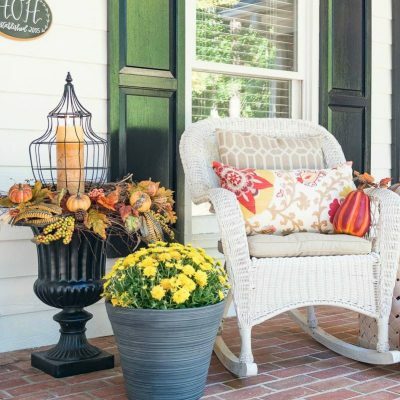 These favorite quick and easy ideas of mine will have your home ready for fall in no time. When the calendar starts to creep into September and the temps begin their annual descent – that’s when I’m ready! 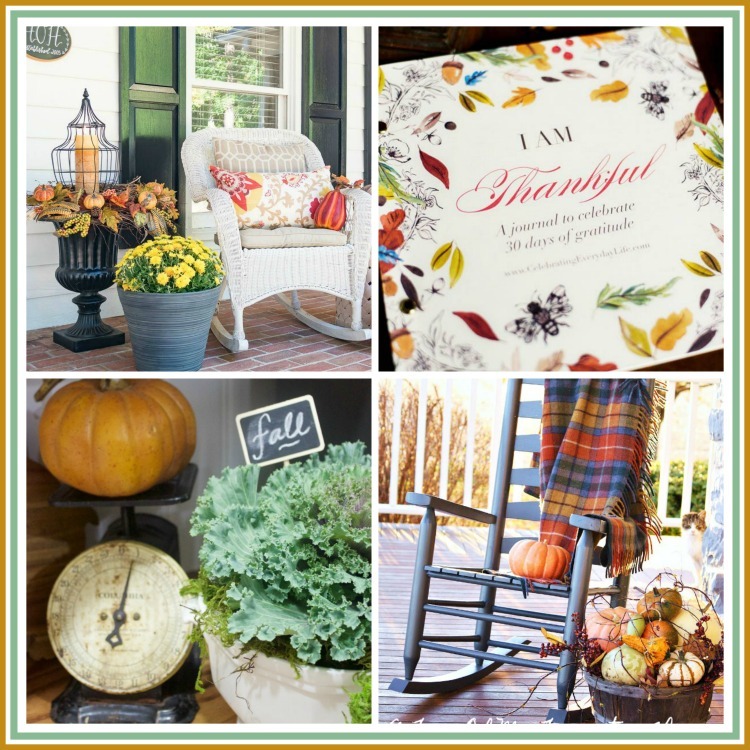 I’m ready to nest and I’m ready to add that cozy feeling to my home with the rich, warm colors and textures of fall. 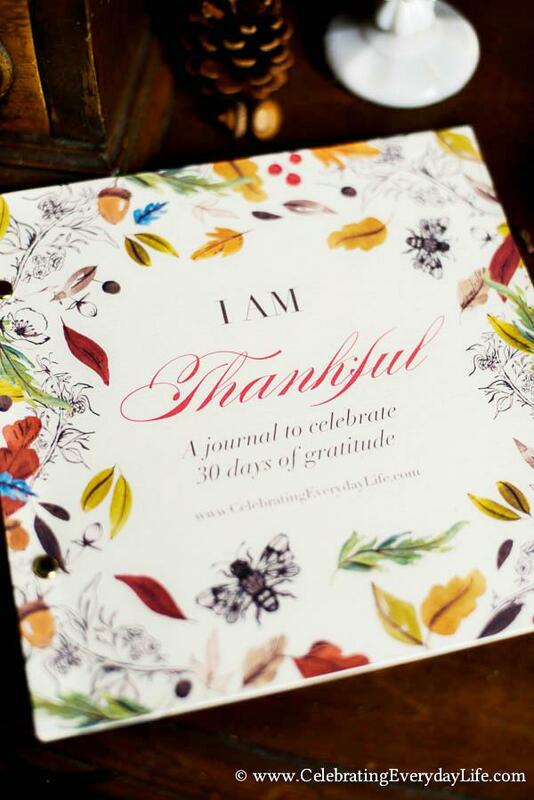 I’m teaming up with some of your favorite bloggers today to bring you our Favorite Fall Things! Be sure to scroll to the bottom for a link to the other posts. I know each of these ladies personally and you won’t want to miss their amazing ideas! I’ve tried going the neutral route with my fall decorations, but it just doesn’t work for me. I have to admit that I’m a traditional fall colors kind of person, so this time of year you’ll find my home filled with varying shades of orange, gold, red, yellow, green and brown. And texture – lots and lots of texture. Oh – and plaid too – gotta have plaid for fall! Some years I go all out in an effort to reflect the bounty of the harvest season, but other times I just want to keep things easy and simple. My hope is that these favorite easy fall decorating ideas of mine will help you when decorating your own home! Simply click on the blog post title above the image to take a closer look at anything that catches your eye. 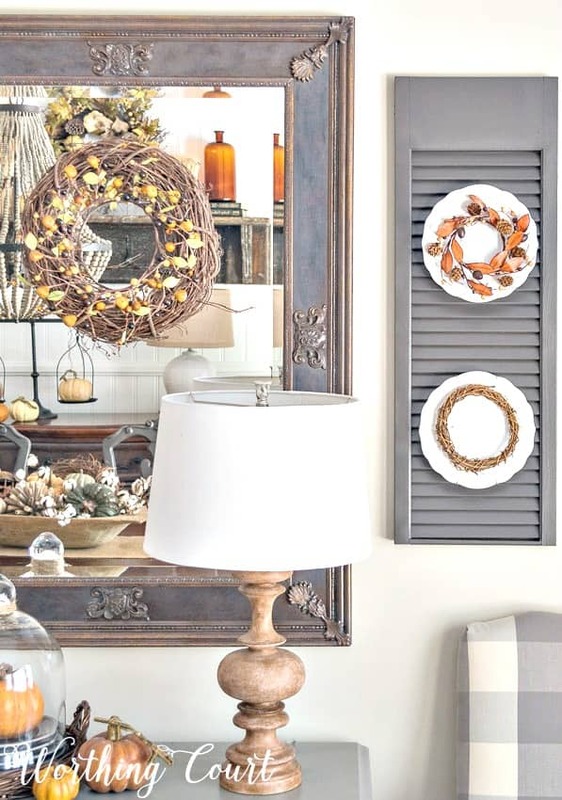 One of my favorite tricks is to hang a wreath on a mirror (using either a suction cup hook or a Command Strip hook). It’s like getting double the bang for your buck! 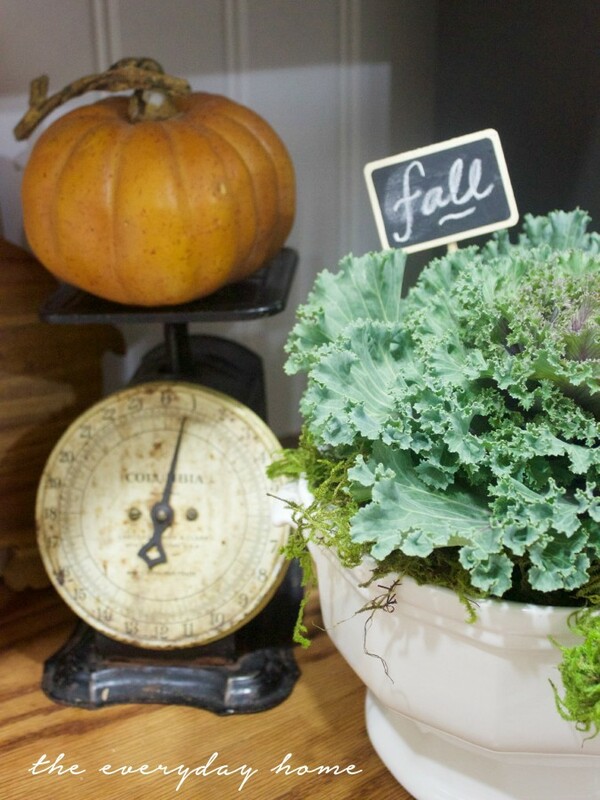 If the mirror happens to reflect other fall decor in your room, so much the better! In this case, I added small little wreaths to the front of white plates hanging on my shutters too. If you have shelves or a bookcase in your home, by all means decorate them! The open shelves in my breakfast room are a great spot for adding fall decor and immediately set the tone for anyone who enters my kitchen. 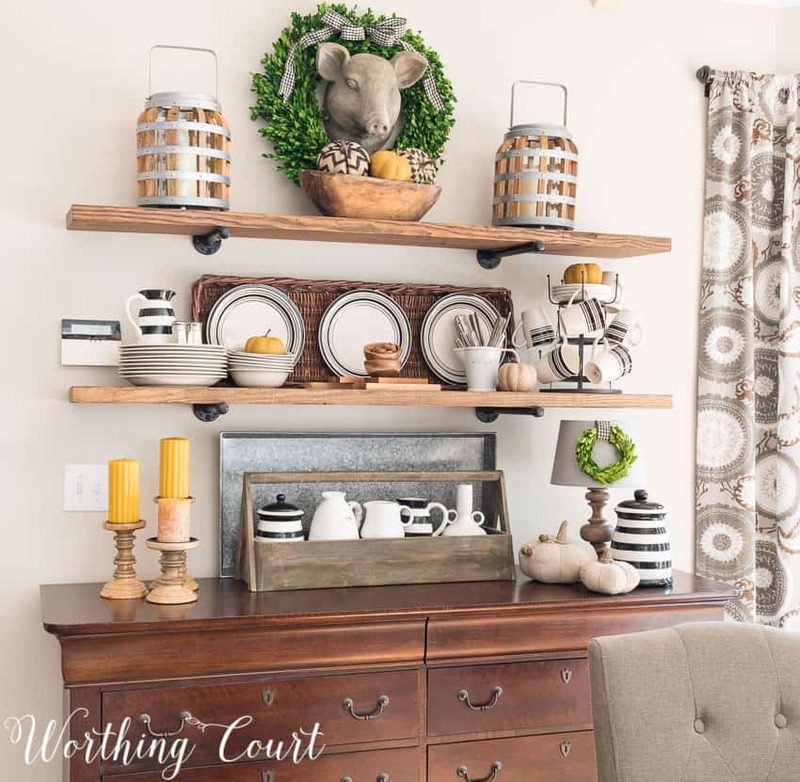 It doesn’t have to be hard or complicated either – let’s take a look at some of my shelf decorating tricks. Place trays, platters or long baskets against the back of your shelves to act as a backdrop to your decorations. It will help to define the space and to make your accessories pop. THESE ARE MY FAVORITE FALL SHELVES EVER! Plates, platters and chargers make decorating shelves sooo easy! You don’t need to spend a lot on them either. You’d probably be surprised at what you can find at the dollar store – that’s where the black and white dishes in the above image came from. Keep an eye out at thrift stores and after season sales too. Baskets – you can’t have too many baskets! 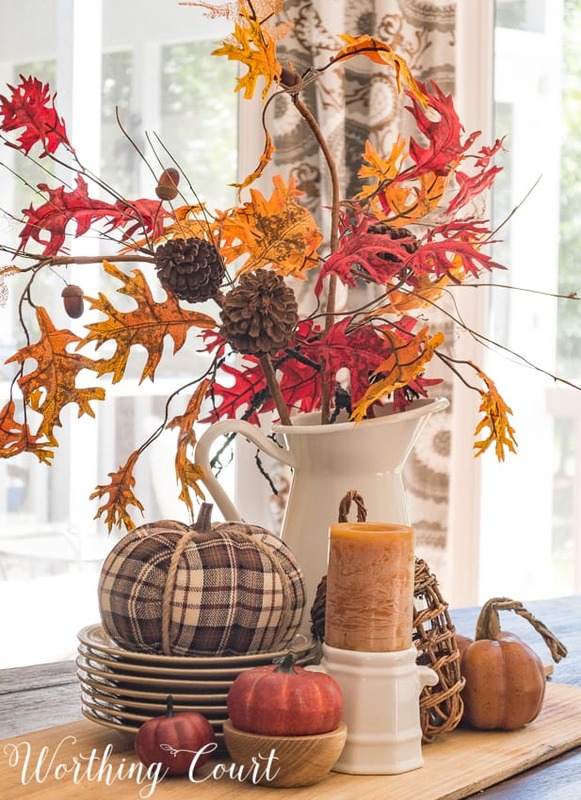 Fill them with throws, pillows, pinecones, branches, pumpkins – anything that reminds you of fall! A good example is my fall fireplace this year. I’ve used three different types of baskets, all filled with something different. 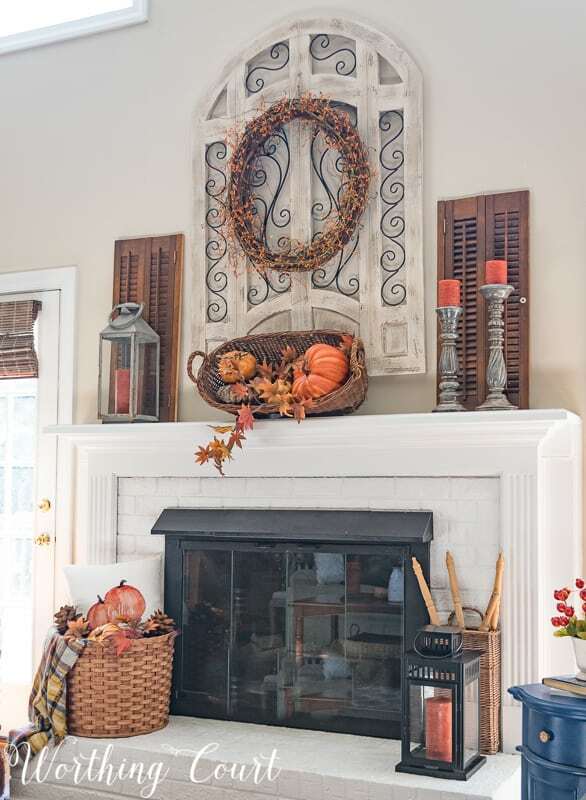 The basket on the mantel is filled with faux pumpkins and a few fall leaves and the one to the right of the fireplace is filled with a few vintage spindles that I picked up at a popup show. The real showstopper though, is the wonderful basket from Amish Baskets! It’s their Heavy Duty Large Round Laundry Basket and the quality is amazing – exactly what you’d expect from Amish artisans. This basket will last me a lifetime. 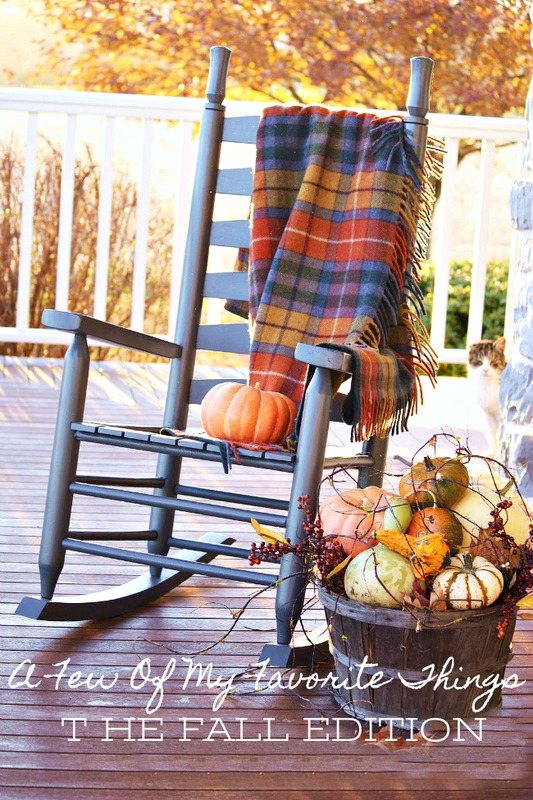 Right now it’s filled with a plaid fall throw, pillow, pinecones and a pumpkin, but I can envision using it all over my home – season after season. Click HERE to see the wonderful variety that Amish Baskets has to offer. Another way you’ll find me using baskets is when I need something super quick and easy to act as a wreath. Y’all – it doesn’t get much easier than adding faux floral stems and bushes to a hanging basket to use in place of a wreath on your door, or elsewhere for that matter! I think that seasonal centerpieces and coffee table vignettes are one of the most common ways to decorate for fall. 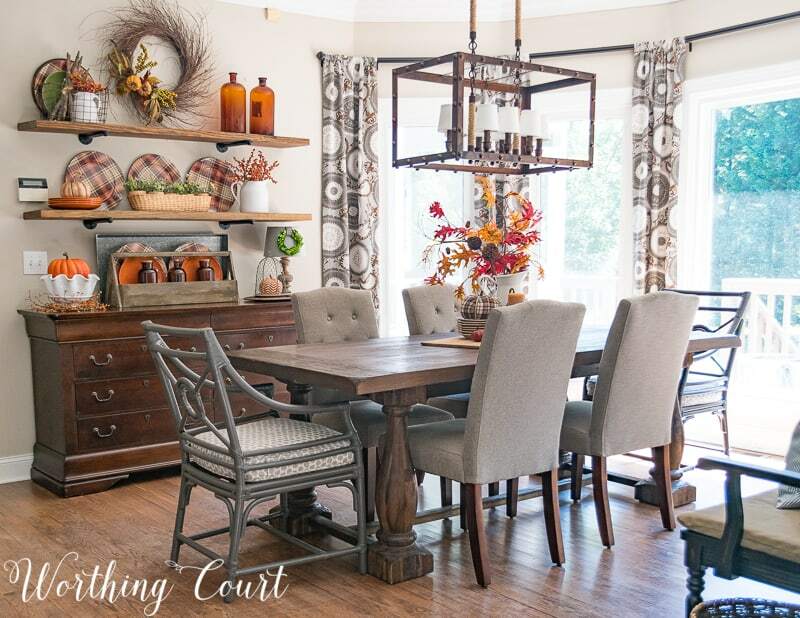 Not everyone has a fireplace with a mantel to decorate, but everyone has at least one table in their home that would be a great place for an eye catching centerpiece! If you struggle with centerpieces, here’s my easy peasy no-fail formula: 1) something to act as a base (tray, basket, etc.) + 2) one tall element (pitcher, vase, etc. filled with sticks, florals or greenery) + 3) a stack of plates to act as a riser + 4) one unique item on top of the plates + 5) small items to use for filling empty spaces. Follow this “recipe” for a great looking centerpiece every time! Lastly, here’s the easiest and most simple way of all to add fall to your home – pillows. Exchange the pillows that you have on display in your living spaces, bedrooms or anywhere in your home to instantly say “It’s Fall Y’all!” 😀 I know we all like to use different colors in our homes, so I’ve done the shopping for you by rounding up pillows grouped by color. Any of these of the combos within the groupings would work well within the same room or even on the same sofa. These Are a Few of My Favorite Things – Fall Edition. Please visit the following blogs and see some of the favorite things they are sharing today. 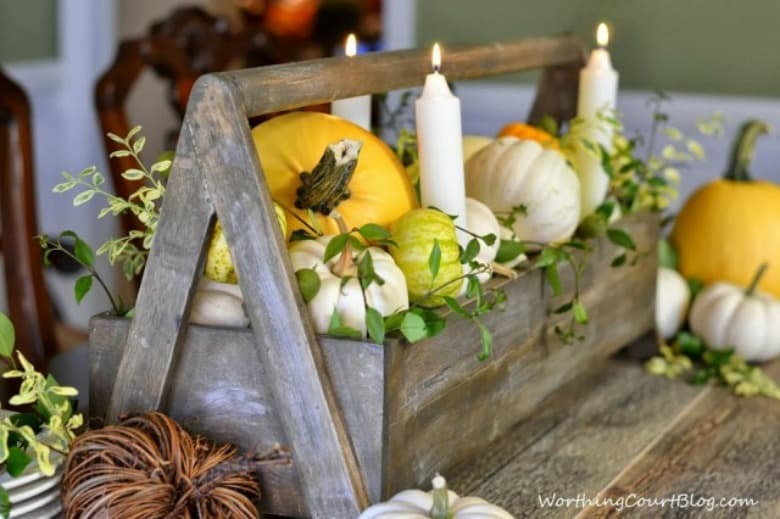 LOVE all your fall decor and bounty! And I agree… best fall shelves ever!!! I just took mine down and your shelves make me miss them! Oh wow! I love it! Your home looks stunning. 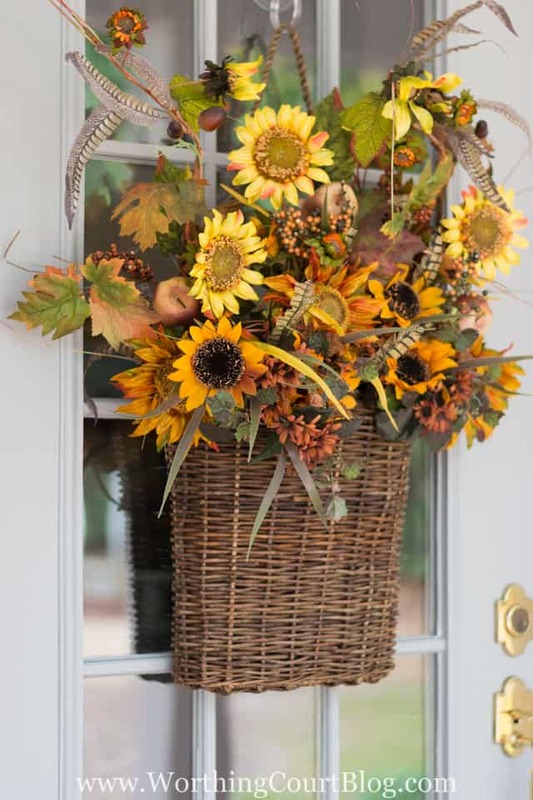 Love the simple wreath the best but with temperatures still in the 90s here, it’s hard to think about fall decor!! Beautiful ideas! I am a traditional fall colors girl too. Need to go and find some more baskets! Everything looks beautiful. I just love to decorate for fall. I love all the Colors of Fall. Your decorating inspires me everyday. I get so many Fun ideas from you Blog. I look forward to seeing first thing in the morning to start my day! I love your fall shelves!!! They look great! 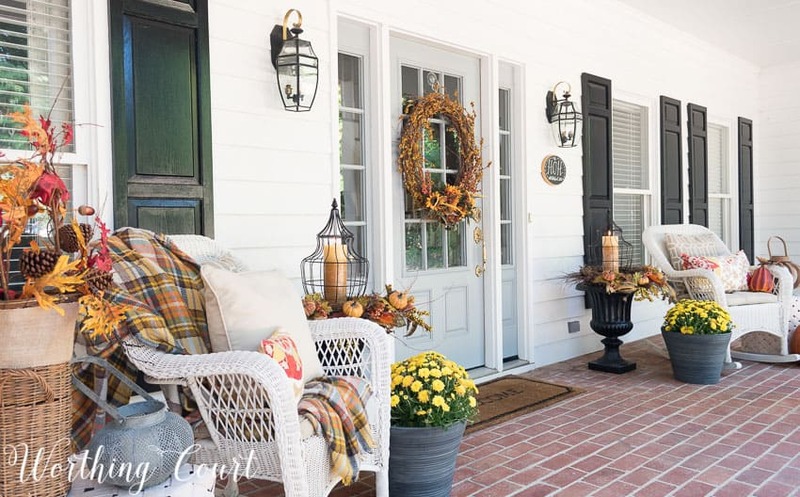 Fabulous fall decor! Well done! Love your fall décor this year. My favorite! Where did you get the plaid chargers?? I think the way you decorated your shelves is my favorite! Those apothecary looking jars look so neat and fall-ish! Love everything you did this year, definitely embracing the colors of the season. Fall is all about color. All white or neutrals just doesn’t do it this time of year! Love all the simple details that give big impact for a dress fall look. Thxs for inspiring! I’m so stealing that idea of the baby shutters over the mantel! My fireplace is odd and the mantel nothing to speak of, been wondering what do. I’m in a rental so can’t”fix it”. Lovely home. No matter the day, month, season or year, your home always says WELCOME! in my eyes. Loving your ideas for fall. I love your fall decorations. I like the oranges, browns, yellows, and reds of fall. I don’t really like the neutral look for such a colorful season, so I’m glad to see you went with the traditional look. Every room looks amazing! Great job and thanks for sharing your home with us.